AdamMaleBlog - Gay Culture, Art, Music, Humor, and more! 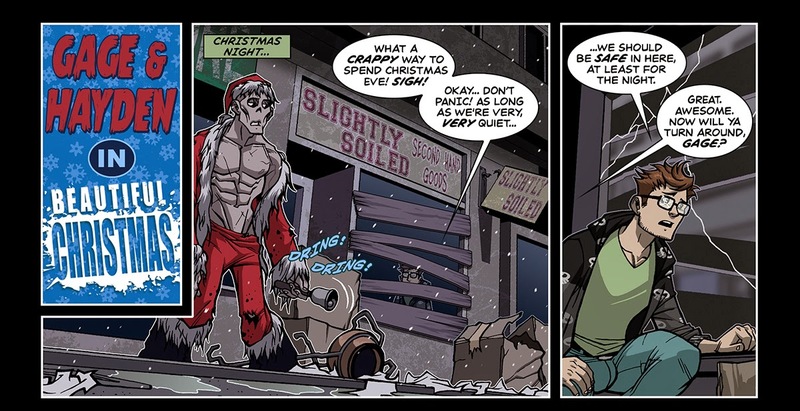 : Preview "A Class Comics Christmas" 26 Page Holiday Special! Free Download! Preview "A Class Comics Christmas" 26 Page Holiday Special! Free Download! Jacob Mott, LOGAN, Leon De Leon, Golden Key and Patrick Fillion, and featuring your favorite Class Comics hunks, this is one Christmas present you won’t wanna miss. This compilation collects all of the Christmas Stripshow episodes, past and present, and includes the fan favorite “I’ll Be Home for Christmas” starring Trip and Glow Worm. It also features the brand new 2014 Christmas Stripshow featuring the boys from Beautiful Dead entitled “Beautiful Christmas!" Hayden decides to give Gage a very special gift at this most wonderful time of the year. Both of these mini comics are written by Patrick Fillion and illustrated by Jacob Mott. It's pretty amazing that this is free download. Tons of great pin-ups and short stories. Watching Naked Justice fight side by side with Santa Claus is a pretty special treat, too. But, not as special as the treat Santa gives Naked Justice when the fighting is over! This may also be the only way to ever see a well endowed centaur wearing a Christmas hat while playing a harp in the snow. You can download A Class Comics Christmas by right clicking HERE. Or, follow the link below and go to their download page! Here are some preview images! Patrick and Fraser of Class Comics were kind enough to help censor the naughty bits so we could share them with you! Be sure to be a fan of Class Comics Twitter and Facebook page, too! Oh, and check out last year's full length Logan's Meaty Holiday Special.